"What kind of dog is that?" Many people ask that question when they first see the Nova Scotia Duck Tolling Retriever at a dog show or special event, or even out at the local park. And no wonder. The little fox-red dog with white feet is not only the world’s smallest and most unique retriever, but probably the breed with the longest name, too! 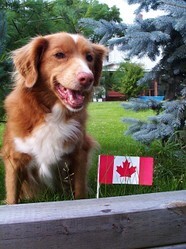 Bred in maritime Canada for centuries, the Toller is the official dog of Nova Scotia. Tollers also have a special talent. By playing along the shoreline, a Toller tolls (lures) ducks and geese towards a hunter. In other countries, fox-like dogs once were used to toll ducks into nets or chutes or towards a hunter, but the Toller is the only breed in the world that both lures ducks towards a hunter and then retrieves the birds that have been shot. The ultimate “tolling dog” is the red fox. While one fox hides near the water, his mate will play along the shoreline, ignoring the birds. Curious ducks will swim to shore to see what the fox is up to, and the other fox will jump out of hiding and grab a dinner for two. No one knows how long tolling retrievers have existed in Nova Scotia, but written records show that little red dogs already were being used in this area in the 1600s to toll and retrieve ducks and geese. Eyewitness accounts of the use of dogs to toll waterfowl in Canada's Maritimes was reported in considerable detail by Nicolas Denys in 1672 and by Sieur de Dierville in 1699. It is know that, by 1860, Nova Scotia hunters were deliberately breeding fox-coloured dogs with an instinct to toll and retrieve. In the early 1980s, the late Avery Nickerson, a major Toller breeder in Nova Scotia, said that his grandfather had hunted with Tollers as a young man in the early 1800s. It is unknown for sure what breeds or types of dogs went into the mixing bowl to create the Toller, but old photos suggest that there is farm collie, cocker spaniel, St. John's Dog and probably some Irish Setter were mixed with the native dogs used by the Native Mi'qmak people for tolling waterfowl. Old hand-written pedigrees show that a single cross to a Chesapeake Bay Retriever was added in the early 20th century. Because the Toller should resemble a fox, it is always some shade or red or orange, usually with at least some white on the chest and toes. Some Tollers have quite a bit of white on their feet, white on the face and a white tail tip. Although Tollers are bigger than a fox, they are by far the smallest of the retrievers, averaging 18-20 inches and 30-45 pounds. Their bushy tails are carried in a high curve, and they move with a distinctive jaunty gait. Most Tollers have pink noses and golden-brown eyes, although some have brown eyes and dark noses. Their water-resistant coats are extremely soft, with an undercoat so dense it can be spun into wool. As a hunting dog, the Toller takes a back seat to no one. Pound for pound, the Toller may be the strongest retriever, and its endurance is legendary amongst hunters who use them. Despite its small size, the Toller has incredible tenacity and strength, pursuing fallen birds even into heavy surf and retrieving big Canada geese, sometimes with a wounded goose fighting all the way back to the hunter. The versatile Toller also can hunt rabbits or upland birds and even herd sheep, not surprising for a breed that was developed as an all-round farm dog and pet that went waterfowl hunting at certain times of the year. Being docile, playful, gentle and not too big, he makes a good family pet. If you decide you want a Toller, be warned. They are extremely smart, and are bred to be independent thinkers. They learn fast, but are bored easily. Tollers need mental and physical exercise, so giving them work to do is the best way to keep those busy minds occupied. Tollers are very sensitive, so harsh training is ineffective. At the same time, Tollers need to know who is in charge, or they will run the household! 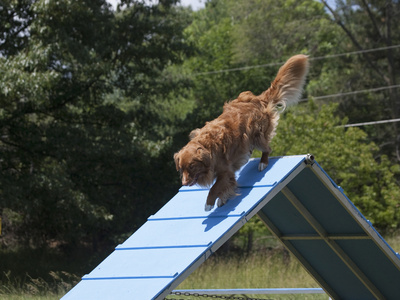 Like his ancestors, today’s Toller is an all-round dog that can do almost anything. They are well suited for active owners and excel in many pursuits, including agility, field tests, tracking, obedience, flyball, search and rescue and drug detection. They usually get along with other dogs and even other pets. Most Tollers adore children, but young children should always be supervised around dogs of any size or breed. As a show dog, the Toller has done well. There are now Best in Show-winning Tollers in Canada, the United States and Europe. The Nova Scotia Duck Tolling Retriever is not for everyone. Tollers shed — and not just a little! They can be vocal. They are retrieving fanatics and will pester you to throw the ball “just once more!” until your arm goes numb. They can be cautious with people they don’t know. But if you are the right person, you will find that a little red dog with the funny name is a dream come true. For more information, go to the Nova Scotia Duck Tolling Retriever Club of Canada. Follow the links to clubs in other countries. Long-time Toller breeder Doug Coldwell of LittleRiver Kennels also has a wealth of breed history, information and photos. I think the Nova Scotia are nice looking dogs. Good info.